Food aficionados can rejoice Feb. 11 at the reopening of SF State’s only fine dining establishment, the Vista Room. The Vista Room, located on the top floor of Burk Hall, is an escape from SF State’s usual grub spots. The restaurant has soft lighting, polished silverware that is replaced after each course and tables dressed with crisp, white cloths — the creases always folded down. 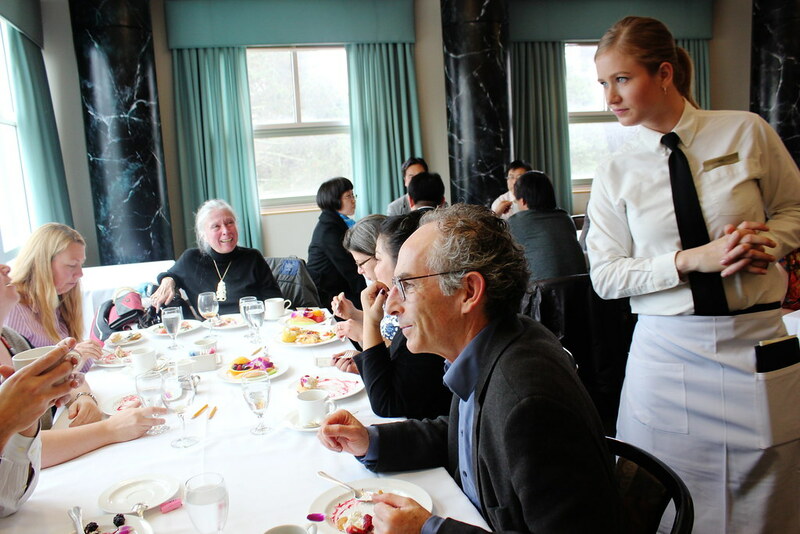 Students from various departments, mainly hospitality and tourism management, are the waiters, hosts, cooks and managers at the Vista Room. The class fulfills a laboratory component that is focused on either food production or food service. The Vista Room is a place for students to safely succeed, fail, and ultimately learn the fundamentals of fine dining. The curriculum is unexplored territory for most of the students who have never been to a fine dining restaurant, according to Yang. The course includes greeting guests, where to place utensils, the proper pacing of a meal and how to politely interrupt a guest. Yang’s goal is that every student leaves the semester confident in their ability to provide service to guests. Reservations for the Vista Room are $15, payable by check only. Lunch is a three course meal: a soup or salad, an entree of fish, pasta or meat and a dessert. The menu is seasonal and changes weekly. Wine is not served at the Vista Room. However, Yang says she wants to push the University to approve a beverage management program so that students are comfortable serving alcohol. Students Elliot Savio and Jennifer Weber are launching their own local catering company using the skills they acquired from the Vista Room. The two plan to keep the company small and only serve private, residential parties. Savio managed the Vista Room last year. He returned this semester to experience working in the kitchen. Colin Johnson, the new hospitality and tourism management department chair, has worked in many sectors of the food service and hospitality industry. Johnson said that a fulfilling career in food service requires not only knowledge and technical skills acquired in the Vista Room, but also an inherent affinity for the work itself. “You have to like it (the food service industry). It’s hard work, long hours and low pay when you first start off, but there are great opportunities,” said Johnson. Students are not paid for their work at the Vista Room. The restaurant’s revenue goes toward food and operating costs. The Vista Room is open weekdays from 11 a.m. to 2 p.m. Reservations can be made at Burk Hall room 329.